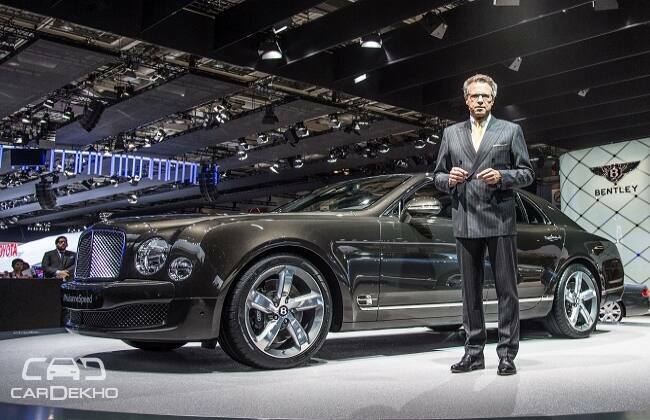 Bentley has unveiled the new Bentley Mulsanne Speed at the Paris Motor Show 2015. Also alongside is the Flying Spur, Continental GT V8 S and the GT Speed at their stand. The new Mulsanne Speed is a fine cocktail of evocative numbers. The 6¾ litre twin turbo V8 develops 530bhp of maximum power and a monstrous torque figure of 1,100Nm, enough to restart a dead planet. The sprint from naught to 100kmph takes just 4.9 seconds and keeps going till 305kmph. Also the engine has been designed to further enhance fuel efficiency and has achieved additional 13 percent gain, which essentially translates into 80km added range. The new Flying Spur is powered by the 6.0 litre twin turbo W12 engine that pumps out 616bhp of maximum power and 800Nm of peak torque. The 0-100kmph timing is now just 4.3seconds and the top speed is 322kmph. And let’s not forget it is just not about power and speed. Behind the athletic exterior design and immaculate interior application of luxurious leather and wood lie a host of advanced acoustic and electronic technologies. A bespoke hand-held Touch Screen Remote allows rear-cabin occupants to control an extensive range of features from the comfort of their seat. With an optional Rear Seat Entertainment suite including two 10 inch LCD screens, DVD players, wireless headphones and an on-board hard-drive jukebox, plus the options of full Wi-Fi connectivity and an 1100W Naim for Bentley premium sound system, the Flying Spur is the perfect place for work or relaxation on the move.